This cover is available for ALL 4x4 vehicles sizes. Excellent Quality made from Semi rigid hard strong material. Strong Durable . Waterproof and can be wiped/cleaned Strong elastic mouth which is made from Vinyl with a 5mm thick elastic cord which makes the cover fit firmly and difficult for thieves to take off. Small and Medium available! Available in Gloss Black or Gloss silver background. 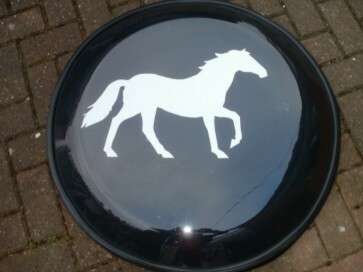 White jumping horse vinyl permenent waterproof self adhesive also included.